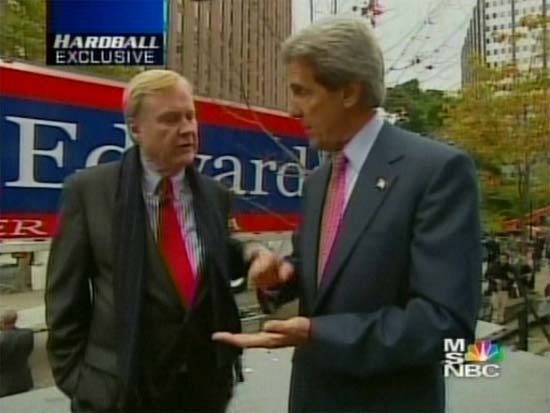 MATTHEWS: I caught up with Democratic candidate John Kerry on the campaign trail in Philadelphia right after President Clinton made his campaign debut in front of an audience of 85,000. How‘s President Clinton doing? You talked to him. KERRY: Fabulous. Great. He‘s really doing well. In fact, he‘s energized enough, he‘s going out to several other states. He‘s not just doing this, he‘s going from here to Nevada. I think he‘s going to do Colorado. He‘s going to Florida. He‘s going to be out there working. KERRY: I think he may go to Ohio. I‘m not sure, but I think he may. KERRY: He feels good. No, no, no, no. He really feels good. He‘s lost a little weight, obviously. He wants to. He wants to lose a little more. And he feels terrific. MATTHEWS: Did he give you any big advice for the last week? MATTHEWS: Did he say, Push Iraq, go domestic? What‘d he—give me a hint here. What‘d he tell you to do? KERRY: No, he just—you know, he really was very concerned about this ammo dump thing that‘s happened today. He thinks that that, and I think, that represents the way in which this administration has miscalculated again and again and again in Iraq. And this is serious because just a small amount of that—I mean, if only a few tons of it fell into the hands of terrorists, it‘s more than enough to blow airplanes out of the sky, buildings to the ground. It‘s deadly serious. KERRY: And it‘s so basic. It‘s so basic to what we should have been doing over there. MATTHEWS: Is this the source of all of these IEDs that have been blowing the legs off our guys? KERRY: I can‘t tell you that. I don‘t know the answer to that. 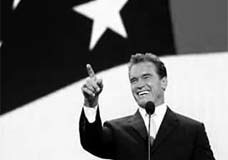 But I can tell you this, that there‘s an awful lot of explosives and weaponry in the hands of insurgents that shouldn‘t be. And it‘s because we didn‘t do the planning. We didn‘t do what we need—you know that this ammo dump was put in a second tier of category of protection, below the ministry of oil, below other buildings in Iraq? And they didn‘t do what was necessary to protect America and our troops. I think it‘s deadly serious, and so does President Bush. MATTHEWS: Was it a failure of the high command of the president himself not to give specific orders to protect that ammo? KERRY: I believe that all of those decisions—the president sits and leads the war council. You sit at that table and you ask your generals and you ask your secretary of defense, Have we made sure? What‘s the or the of priority? What are our lists? Do we have enough troops? Are we going to be—the fact is, the Army chief of staff said, You need several hundred thousand troops. He listened to Don Rumsfeld, who was wrong. He didn‘t listen to the professional military. I think that‘s a failure of the commander-in-chief. MATTHEWS: This president has said—President Bush has said over and over again we‘re going to turn the country over to the Iraqis. We‘re going to turn security over to the Iraqi security forces. This horrible event of the weekend, Senator, does that show that the Iraqis are in no shape right now to protect the security of their own outfit? This was apparently an inside job, it‘s been reported, 50 guys executed on our side, and they were sold out by somebody within the unit, apparently. What does that tell you? KERRY: Well, first of all, we know that the administration has misled Americans about the numbers of troops that are being trained. Don Rumsfeld said several months ago to Congress there were 200,000. Then he corrected it to 100,000. That has now been re-corrected by fact to 22,000. So they haven‘t been training people adequately. Secondly, when you train people, you don‘t just leave them in an unprotected status in a state of war, you do what‘s necessary to guarantee that you‘re protecting what you‘re investing in. They haven‘t done that for the contractors. They haven‘t done that for the people doing the elections. And they haven‘t even done it now for the military. It underscores the utter—look, these aren‘t my words. 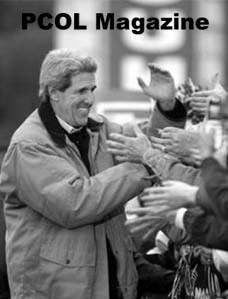 KERRY: These are Senator Lugar‘s words, chairman of the Foreign Relations Committee, Republican. He‘s called it “incompetent.” Senator Hagel has called it “beyond pitiful, beyond embarrassing. It‘s in the zone of dangerous.” Now, we can have more of the same with President Bush, or we can move to have somebody who knows what they‘re doing, who knows how to get this training done, who can bring allies back to the table and get this job done. We have to get this job done. Make no mistake. KERRY: We have to do better. MATTHEWS: ... take this job right now? MATTHEWS: That‘s all I need. Thank you, Senator.